Top: Norys Pina, the recipient of the Jane LaChapelle McCarty MLK Leadership Award gives a speech. 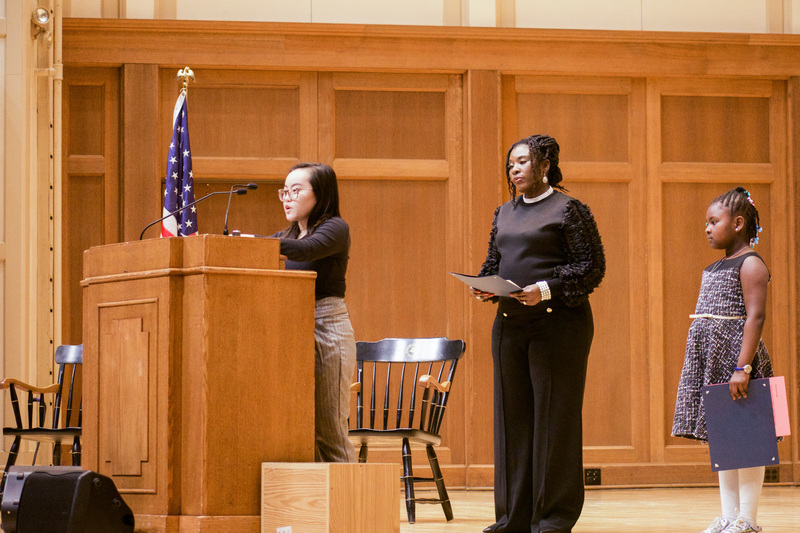 Bottom: Catlin Yang reads her winning MLK essay from the 2019 essay contest. On Monday, Jan. 21, Lawrence celebrated Dr. Martin Luther King Jr. (MLK) Day by holding a variety of volunteering opportunities and faculty teach-ins. The campus was also the site of the 28th Annual Fox Cities Dr. Martin Luther King Jr. Celebration which was co-hosted by Lawrence and African Heritage, Inc. The volunteer opportunities were organized through the Committee on Community Service and Engagement. The off-campus volunteer opportunities that were available included volunteering at the Boys and Girls Club of Appleton and Menasha, Brewster Village, Feeding America and Riverview Gardens. The teach-ins that were hosted included “Systemic Inequities in Education and Literacy” by Assistant Professor of Education Stephanie Burdick-Shepherd, “Hunger and Health in a Wealthy Nation” by Associate Professor of Anthropology Mark Jenike, “Youth Mental Health” by Associate Professor of Psychology Lori Hilt, “The Global Climate Justice Movement” by Stephen Edward Scarff Professor of International Affairs and Associate Professor of Government Jason Brozek and “Systemic Racism and the Development of the White Racial Frame” by Assistant Professor of Ethnic Studies Jesus Smith. 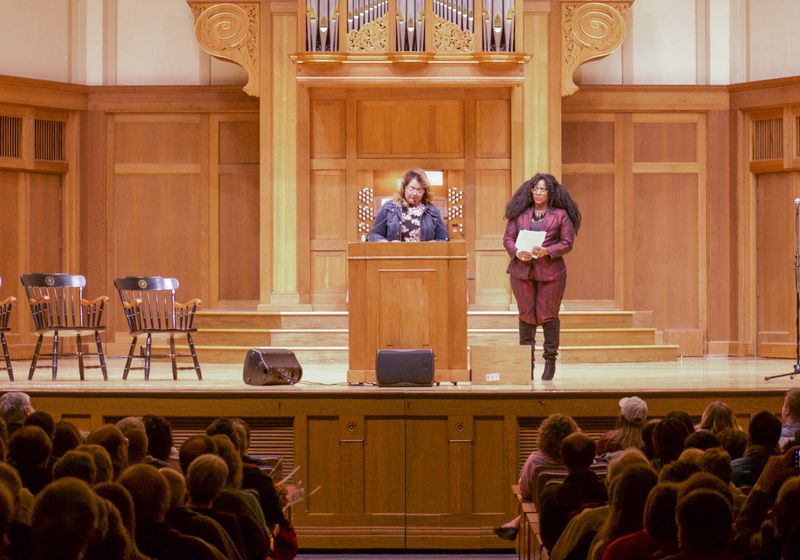 In the evening, members of the community congregated at the Memorial Chapel for the Dr. Martin Luther King Jr. Celebration. Attendees were welcomed by Rev. Leah Hart-Landsberg and Vice President for Diversity and Inclusion Kimberly Barrett. After a song led by freshman Kyree Allen and a prayer by Pastor G.A. Manns of Appleton Sanctuary Outreach Ministries, the winners of the Jane LaChapelle McCarty MLK Community Leader Award and the Dr. Martin Luther King, Jr. Educator Award and the MLK Essay Awards were presented. The Keynote Address was given by Dr. Eddie Moore Jr., the Founder/Director of the White Privilege Conference and the Privilege Institute. Moore has also co-editor of multiple publications and has more in the works. Moore’s address asked the question “Why Keep Dreaming? A Time for Action” which was the theme of this year’s celebration. Moore encouraged people to continue to volunteer for MLK Day, but to keep in mind that King advocated for direct action and real change. One of the themes of Moore’s talk was that MLK was widely regarded as too revolutionary while he was alive, and only since his death has he become accepted by much of white America. Moore encouraged those with more privilege to use it to help those with less privilege, and that although we’ve progressed some since King’s time, current events show that we haven’t progressed far enough.